Being an Indian cricket fan is not easy. It is not for the faint-hearted. They have made us proud with their performances on numerous occasions but at the same time have disappointed us equally with horrible performances. When a team gets bowled out for a low total in the first innings of a Test match, it becomes pretty hard for them to make a comeback. It’s true that a lot depends on the conditions but the advantage is always with the opposition once they have sent the batting team back to the pavilion with a paltry first innings score. However, there have been numerous occasions when teams have come back from the dead and saved themselves from the blushes. The Indian team itself has provided us with such thrills on numerous occasions over the years. Sometimes they succeeded in saving the match and sometimes they went one step further, thus registering memorable victories. 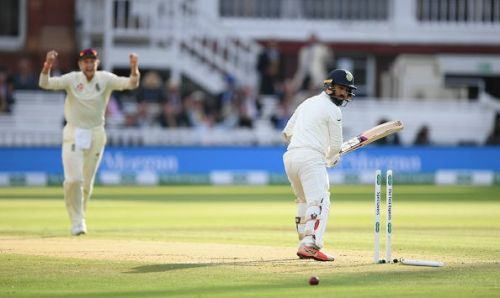 The ongoing second Test of the series between India and England at Lord’s has presented a similar scenario as well. India have been bowled out for 107 runs. The top scorer of the innings was Ravichandran Ashwin with 29 runs to his name. It was the English fast bowling great James Anderson who led the destruction with a five-wicket haul. He was ably supported by Chris Woakes who picked up three wickets as well. It remains to be seen whether India can make a comeback in this match. If the visitors can do so, it will turn out to be another memorable encounter and will enrich the history of Indian cricket further. The bowlers have shown in the previous match at Edgbaston that they are capable of taking all 20 English wickets and that too for paltry totals. To keep our hopes high and alive, let us now have a look at five of those occasions in Indian cricket history when the team literally came back from the dead.